Yvonne Strahovski is an Australian actress who became known for her starring role as CIA Agent Sarah Walker in the NBC spy drama series Chuck. She went on to gain further fame with her roles as Hannah McKay in the Showtime drama series Dexter, and as CIA Agent Kate Morgan in the Fox event series 24: Live Another Day. From 2017, she plays Serena Joy Waterford on The Handmaid’s Tale. Her film credits include Anne Frazier in Killer Elite, Emily McKenna in The Predator and Terra Wade in I, Frankenstein. Yvonne Strahovski was born on July 30, 1982 in Maroubra, Sydney, New South Wales, Australia. Yvonne was educated at Santa Sabina College in Strathfield and went on to graduated from the University of Western Sydney‘s Theatre Nepean in 2003. She took acting lessons at age 12. Yvonne Strahovski was born to Polish parents Piotr Strzechowski, an electronic engineer, and Bożena, a lab technician. Her parents immigrated from Warsaw, Poland to Australia when she was young. They now live with her in the US. 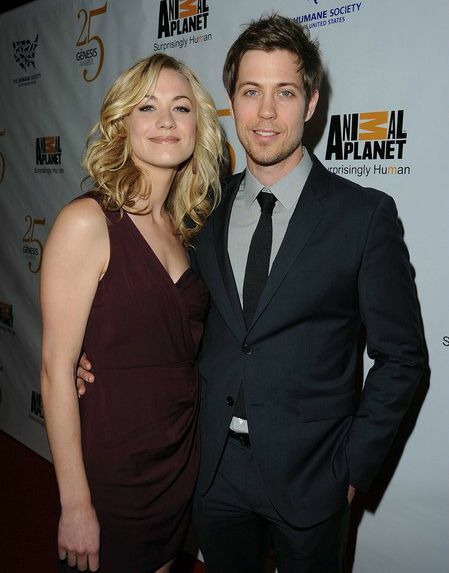 Yvonne Strahovski married her longtime boyfriend in 2017 after dating for over eight years. They announced that they were expecting a child, a boy, in May 2018 and she gave birth to her son in October 2018. She wears a size 9 (US) shoe. Strahovski’s first acting role came in 2007 when she was cast as Sondra in the British-Australian psychological thriller film, ‘Gone’ starring Shaun Evans and Amelia Warner. Yvonne made her television debut in the year 2004 in an episode of the Australian satirical TV show ‘Double the Fist: Fear Factory’ as Suzie. In 2005, she landed her first significant role on television, playing Freya Lewis in the drama sitcom headLand. She was part of the series from 2005 to 2006. Yvonne earned her first breakthrough role in the American comedy-drama series Chuck. She played the role of CIA Agent Sarah Walker in a total of 91 episodes, for which she won the Teen Choice Award for Choice TV Actress – Action in 2010 and TV Guide Award for Favorite Actress. It was this role that brought fame to her and subsequently led to a string of starring roles in both films and Tv shows. The success of the show helped her to settle in the US. Dexter was another TV series that made her a household name in America. She played Hannah McKay in the seventh and eight seasons of the series. Her performance in the show further added momentum to her acting career. She won the Saturn Award for Best Guest Starring Role on Television. In 2017, she began playing Serena Joy Waterford in the Hulu drama series The Handmaid’s Tale. The show was an instant hit, and with that, her career propelled at a lightning speed, for which she has received a Primetime Emmy and a Golden Globe nominations. Yvonne Strahovski has a net worth of $12 million. She lives in Los Angeles, California. She changed her last name Strzechowski to the phonetic pronunciation Strahovski after she moved to America. She has two pet dogs named Chazzie and Willy. Strahovski launched a small theatre company following her graduation. Since her parents are Polish, she speaks Polish as well as English. In 2008 she was ranked #24 on Wizard magazine’s Sexiest Women of TV list. She was ranked #50 in the FHM Australia list of “100 Sexiest Women in the World” in 2011. Maxim ranked her #77, #35 and #46 in their list of “Hot 100” in 2010, 2012 and 2013, respectively. In 2019, she was nominated for Golden Globe Award in the Best Performance by an Actress in a Supporting Role in a Series for her role in The Handmaid’s Tale. The award went to Patricia Clarkson for Sharp Objects. Strahovski is a staunch supporter of PETA and appeared in their “Adopt, Don’t Buy” campaign.